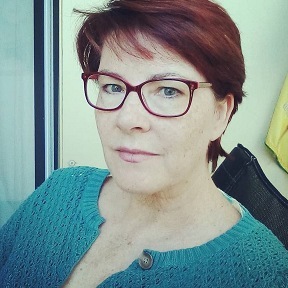 Today I am happy to share a guest post about where the idea for the book came from, but I also have an excerpt and she added a tasty recipe as well. Enjoy! When they find out I wrote a book, the first thing people ask me is, “What’s it about?” When I tell them it’s about a modern woman who goes back in time to interview Alexander the Great and gets kidnapped by him thus stranded in 333 BC, they then want to know what gave me the idea. When I was 7 years old, my father gave me a book on Greek Myths. (This was before my Sunday schooling and first communion*.) He didn’t tell me it was fiction, so I started reading about the beginning of the world, the darkness, the light, Zeus, Hera, and all the gods and goddesses, and thought to myself “Cool!” My first gods were the Greek gods – and one of my favorite stories was the rapt of Persephone by the god of the Underworld, Hades. When Ashley, a modern woman from the future, travels back in time and meets Alexander the Great, she has no idea what will happen. Alexander mistakes her for Persephone, goddess of the dead, and wrenches her from the blue light of the tractor-beam. It doesn’t help her that the beam had been set up under a pomegrenate tree, and that she had been kneeling on the ground crying a minute before because her interview had been such a dismal failure. Alexander sees her, realizes who she is, and decides to “save” her, thus condemning her to live in the past. She must learn to survive in a time with no decent shampoo, no teleport station, floating vid screen….she’s stuck in the past and she’s terrified – but she’s tough. Alexxander has pledged to protect her, but she has to contend with his other wives, his insane mother, his army generals – and someone who does not want her around. 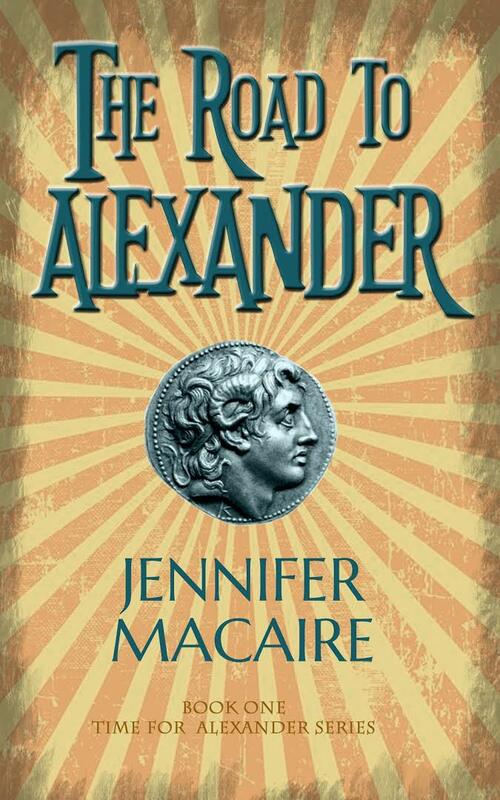 The Road to Alexander is book I in the series (it has 7 books in it – all are written and the last one is slated for March 2019). The books can be read as stand alone, although the story is continuous. In books I – IV, Ashley follows Alexander’s army (cue about a year’s worth of research), then in book V, history as we know it become speculative – Ashley saves Alexander from death, they leave Babylon and strike out on their own. But now, druids have gotten wind of Ashley’s son, Paul, who should never have been born. According to their oracles, he can change the world, so they’ve sworn to capture him. (Cue lots of adventure!) At any rate, I had a wonderful time writing the series, and I hope readers have as much fun reading it. “Where do you come from?” I shook my head. “That means no, where I come from. And I can’t tell you.” We stared at each other. Alexander’s face was paler than usual, his forehead damp. “The gods are playing with us,” he said slowly. “Perhaps it’s true.” I couldn’t face him any more and I turned my head. “Oh, no, you don’t.” He took my chin and made me look into his eyes. “How do you know he will die by the hand of someone he trusts?” I shivered. I would have to tell him, and by doing so change the course of history. A sharp pain was starting in my toes and I wondered if it was the erasure that was beginning. In a moment I would disappear. Probably writhing in horrible pain. I glanced down, expecting to see my feet disappearing but no, it was just Alexander, standing on my foot. “You’re on my foot,” I said, pointing. He cursed and stepped backwards. “I need to know. Are you really an oracle?” I shook my head. “No, I’m not. I’ve never even seen an oracle, and I don’t know what they do, or how they act. When I was in the palace, all I could think of was my baby, and that Darius had kidnapped him. I was angry. I said something I regret. If it turns out to be true, we’ll talk about it then. Right now I’m just glad to be out of there and away from him.” “He was a great man,” said Alexander. “But you’re a greater one.” I touched his face and then pulled him towards me and kissed him. “And you’re the best kisser in the world. Who taught you?” He opened his mouth to speak then snapped it shut. “My mother was right. All women are sorceresses.” My mouth twitched. “For once, she was probably right.” I linked my arm through his, and he didn’t pull away. He was not convinced and was still angry, I could tell. He hadn’t forgiven me, and I knew it was only a matter of time before I’d have some serious explaining to do. Bleakly, I wondered what I could invent. Rinse the lentils thoroughly, then put them into a pot with the broth to boil. Reduce heat and simmer until lentils are tender (about 45 min – 1 hr). Skim the top, add the vegetables, and simmer until cooked through. If the soup seems too watery, sieve some of the water out (or add cornstarch, although that didn’t exist back then!) Now add the vinegar and honey. Pour into serving bowls and add a good dollop of olive oil (about 2 tbsp per serving), sprinkling on coriander seeds and salt and pepper to taste. And don’t forget to count out exactly 12 coriander seeds! Thank you, Jennifer Macaire and RachelsRandomResources.